Hyundai tops scrappage charts | What Car? Hyundai has sold more cars through the UK Government's scrappage scheme than any other manufacturer. The car maker has sold 26,613 cars since the scheme started almost 1400 more than Ford, its closest rival in the scrappage charts. 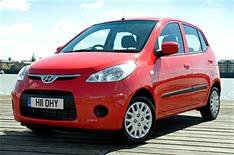 Hyundai's i10 city car accounts for more than half of all its scrappage sales so far. Toyota comes third, with 18,000 sales through the scheme, while Nissan has sold the most British-built cars 84% of the 9000 cars it's sold through the scheme were built at the firm's factory in Sunderland. New car registrations for October have increased 32% compared with the same period last year, with scrappage taking the credit. Year-to-date registrations show car sales are 12% down, though. Paul Everitt, chief executive of the Society of Motor Manufacturers and Traders (SMMT), said: 'October has experienced this year's biggest monthly increase in registrations with the successful scrappage scheme accounting for over 20% of them. 'We have seen additional demand created by the extension of the scrappage scheme and customers wanting to avoid the VAT increase planned for January. However, a note of caution to the figures has been raised by Graham Bushby, head of motor business advisers Baker Tilly. He said: 'The October 2009 registrations are skewed by the drag of registrations intended for September into October that couldn't be achieved because of shortage of supply of entry-level models.